Sister to: Anna (Louis J. Tegtmeier), George (Anna “Julian” Rugen), Herman (Alvina Nebel), Amanda (George Rugen) Minnie (Leroy M. Fulton), Della (Herman Rosenow), Albert (Irene Brandt), Edwin, Wilhelm (Virginia L. Martin), Arthur (Gertude Gapinski) Tatge. 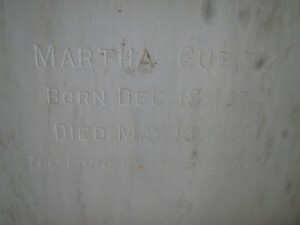 Wife of John H. Guritz, married February 2, 1902. Mother of “Harry” Harvey W. Guritz. Mrs. John H. Guritz, nee Martha Tatge, was born Dec. 19, 1879, at West Northfield. Here she grew into young womanhood and on Feb. 2, 1902, was united in marriage with John H. Guritz. To this union one son Harvey was born. Immediately after their marriage, the young couple moved to Jackson, Minnesota, where they engaged in farming for ten years. In 1912, the family came to Beecher, and acquired a farm about 8 miles northwest of Beecher just east of the state line. With the exception of two years spent at Arlington Heights, IL they have resided ever since on this homestead. Never quite well, the departed early this spring contracted a severe cold, which with other complications, compelled her to seek the bed. Although the best of medical skill was employed, and the most loving attention and care was given her on the part of her son and husband and her mother and sisters, it became quite apparent that her days of earthly sojourn were numbered. As a last hope, an operation at St. James Hospital, Chicago Heights, was resorted to. This operation did not bring the desired results, for she passed away on Wednesday, May 13, at the age of 45 years, 4 months and 14 days. She leaves to mourn, her husband, her son, Harvey, her parents, five brothers, four sisters and a large number of other relatives and friends. Funeral services were held on Saturday, beginning at 1 o’clock at the home and continued at 2 o’clock at St. Luke’s Church, where Rev. G. Horst, in both German and American language spoke words of comfort and consolation to the bereaved relatives. Interment was in the Beecher Mausoleum. A true loving daughter and wife, who faithfully in Christian spirit and devotion served those nearest and dearest to her has thus passed out of our midst. The very large attendance as well as the numerous floral pieces, gave added proof of the fact that she was greatly esteemed and respected.